electro-music.com :: View topic - Audiomulch finally makes it to Mac OS X!!!!! Audiomulch finally makes it to Mac OS X!!!!! Posted: Mon Mar 16, 2009 5:00 pm Post subject: Audiomulch finally makes it to Mac OS X!!!!! Subject description: This is awesome news!! Audiomulch, the legendary Windows-based sonic music easel finally makes the leap to Mac OS X, as v2 appears in May 2009. Great news for Mac OSX owners! However, note that is is not free, unlike the exclusively Windows days. Now you need to pay $89 to holler with this thing. It's 189 Euros in the UK??? It's $89 for US customers. Er noooo! If you look at at the news page it's 89 to buy PLUS 89 for the upgrade, or 189 altogether (US dollars!). Fair play to Ross, but the uk pound is now worth 71 cents roughly. Ah, I missed that. Sorry. Good luck to Mr. Becina! Its now out, 90 day evaluation download. I got it. It's lovely! Hmm- found a bug in the weird non-Maclike interface. If you remove the tools palettes from the top bar in the main window (a very windows thing), there appears that there are no way of getting those tool bars back again. Anyone noticing this, or how to get them back again? Are you talking about View->Toolbars? I'm still trying to work out the point of this software! How are you meant to integrate it with anything else, it doesn't seem to support rewire or running as a plugin. It seems pretty limited to me or am I missing something? I think I should point out that at the time, there was nothing else out there apart from perhaps Max/MSP and Supercollider, that came anything near AM. Audiomulch was cheaper and was really easy to use. Since then we have had a plethora of other software that essentially does the same thing, released, and so AM doesn't really come across as anything that excited- at least to start with. 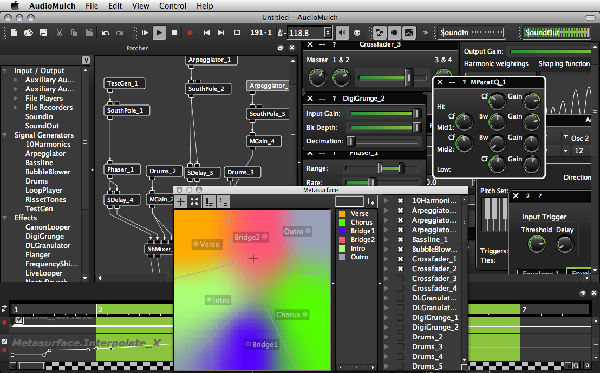 I think it has been people like "Four Tet" who have put AM on the Map, and created a buzz about the software. The limitations are what people like about it, as you can use AM as a sort of 'sound canvas' where extremely fucked up things can be created, and then dropped into an external DAW. And nope, it's not as sophisticated as to support Rewire, but that's missing the point. There's a huge list of artists on the AM page who have used AM for several recordings. Many of these artists are pioneers from the world of early British, German and American electronica. Ill look into it a bit more then, the thing I couldn't immediately work out is how use control signals. Does it support this sort of thing? Thanks for the info Tom, I will have a listen and play around a bit more. audiomulch ... later albums were indeed mulched !!! & this amazing album has been mulched too he says !!! Too bad they don't do what Waldorf does. Two OS installations on the same license/DVD. I've installed Audio Mulch 2 on OSX using my windows license. So what brought on that moment of madness? I thought you detested "the dark side"? PS- download Camino. It's a browser that rocks on the Mac. Built on Mozilla technology, but behaves like Safari. It's a brick shithouse of a workhorse! >>So what brought on that moment of madness? I thought you detested >>"the dark side"? Not really. I was supposed to get a loaner a few years ago, but that fell through. I bought one out of need to be Mac-savvy for a project at work. I can't say I've seen anything impressive with Safari, so far. But it's only been a few days, and I haven't done much web browsing with it. Too many browsers out thee. Too many Linux distributions. Too many programming languages. The world needs to consolidate on just a few, and make those few absolute gems. No kidding. The point is ... there are too many choices of inferior software. The Open source movement was supposed to make software better because people could write their own, or fix something that didn't work good. That doesn't seem to be what happened. Now we have many more programs which aren't robust.